Do Mondays Get You Down? Who doesn’t dread Monday mornings? When the alarm sadistically halts the weekend refuge, dragging oneself out of bed is like trying to separate your toes glued together with super glue. Sometimes the dread of going back to reality is as debilitating as the actual reality. Before we even get out of bed….we are defeated. Sweet friend, I so understand all about the places in life that are not fair. The workplace drama, the power struggles, greedy and jealous people, health issues, financial deficiencies, the sick child, the loneliness, the prodigal loved ones, difficult relationships, and the staggering grief that won’t subside. At times we wonder how we will get through the day right? We live in a fallen world; therefore, life just stinks sometimes. But when our focus is saturated in our situation, we are automatically catapulted into defeat. Whatever you are facing that rains down dread like a monsoon….take it to Jesus in a drop to the knees, can’t handle it prayer. Today, ask God to take over your mindset and help you focus on His faithfulness and the good things in your life. 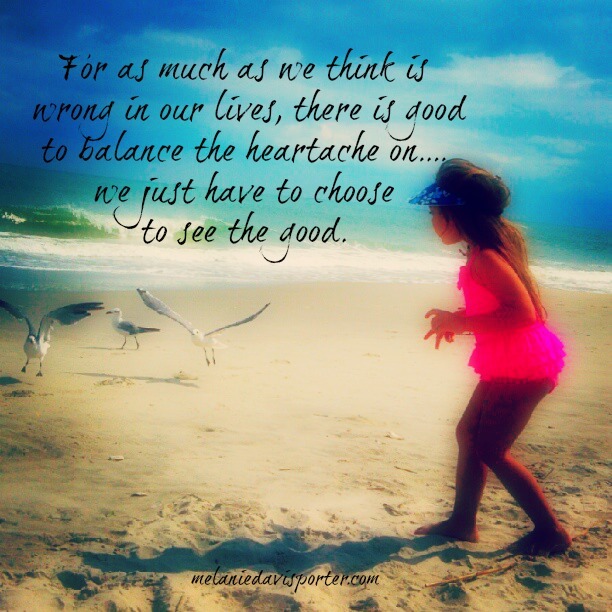 For as much as we think is wrong in our lives, there is good to balance the heartache on….we just have to choose to see the good. Do you have a home? A family or people who love you? Good health? Are there children in your life to make you smile? Is there a little money in your pocket? What about a beloved pet eager to greet you every day? Do you have a true friend, a praying momma or a caring spouse? The fact that you woke up breathing is a miracle that God orchestrates every day. He wants us to acknowledge the good in our lives even when we are walking through the valley. When the focus is on our problems, He can’t grow us to trust Him in the hard seasons. 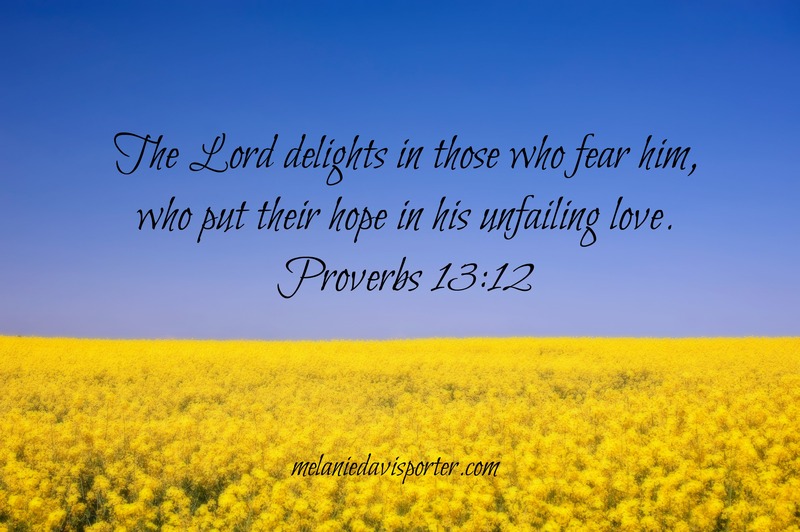 The creator God who put the stars, sun and moon in place, faithfully oversees His children’s lives, giving us good things; revisiting His previous faithfulness, gives us hope. Hope my friends…. is what will carry us through the dread of Monday mornings. Never forget about the good he has given in the midst of your trial. 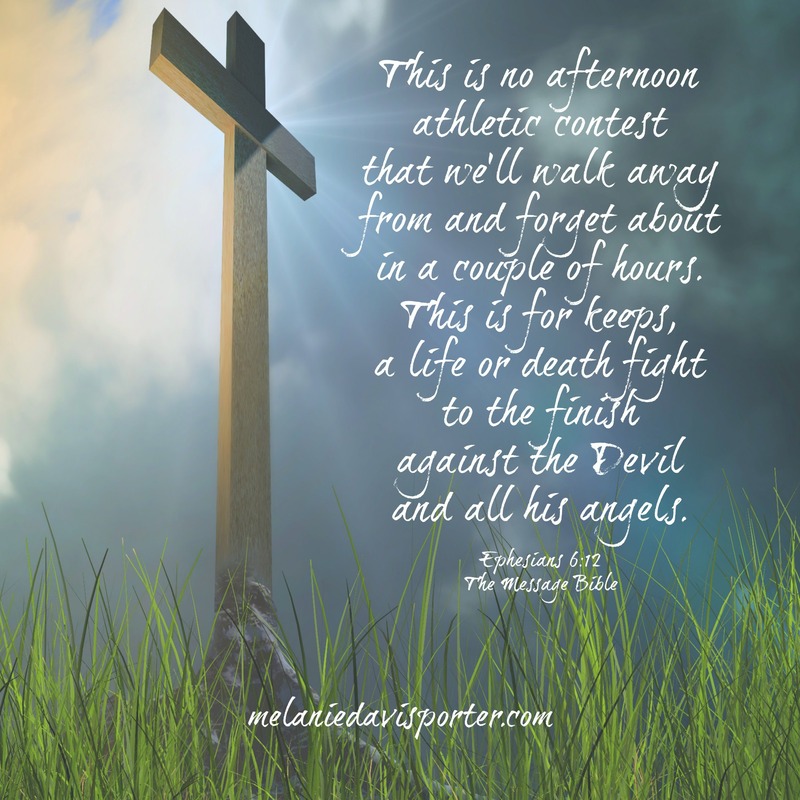 My challenge for you today…..
1 ~ Ask God to carry the burden of your oppression today…and actually let Him have it. Giving Him the burden means you don’t dwell on it, worry about it or walk around in gloom. Instead you choose faith, believing God will bring you through this trial in his time. 2 ~ Make a list of all the good things in your life and thank the creator for that good. 3 ~ Take each moment…and enjoy the moment for what it is……A beautiful sunset, a brief rest from the noise, a game of catch with the puppy, a 15 minute walk in the evening, an unexpected phone call from a friend, a lazy night at home, a bible story read to a child, prayer time with your family or a friend. Whatever the gift is for the moment….bask in it and thank God. Choosing to not focus on the things we dread is a discipline of obedience to God. Life is never going to be perfect even when the house is clean, the bills are paid and the kids behave. Life is never going to ever arrive at perfection. Don’t let the dread of facing the hard things in life push you off the slope of hope. Choose faith and enjoy the moments of perfection God gives in the little blessings that come your way every day. Just focus on Jesus and pour your heart out to him. When no one understands…..Jesus does. Hang your hat on hope today friend. I tripped over a memory today and lost my balance for a while. You know the type of memory….a voice from the past that comes back around to hurt? It reminded me of a devastating experience. Horrible words, overwhelming circumstances …a flood of tears. Along with the memory came the voices provoking the details. Before long, the memory exploded like a glorious Fourth of July fireworks display. Only the emotions accompanying the fireworks are anything but glorious. The emotions reveal insecurities…feelings of being unworthy, unwanted, unloved. I entertained the voices. I listened, and since I didn’t shut them down immediately…they continued. Then suddenly I realized what was happening….and I cried out to JESUS. I went to the Word of God. Reading three different translations…I grasped my failure. God opened my eyes clearly. We Christians can be guilty of being too casual about the enemy’s intentions. 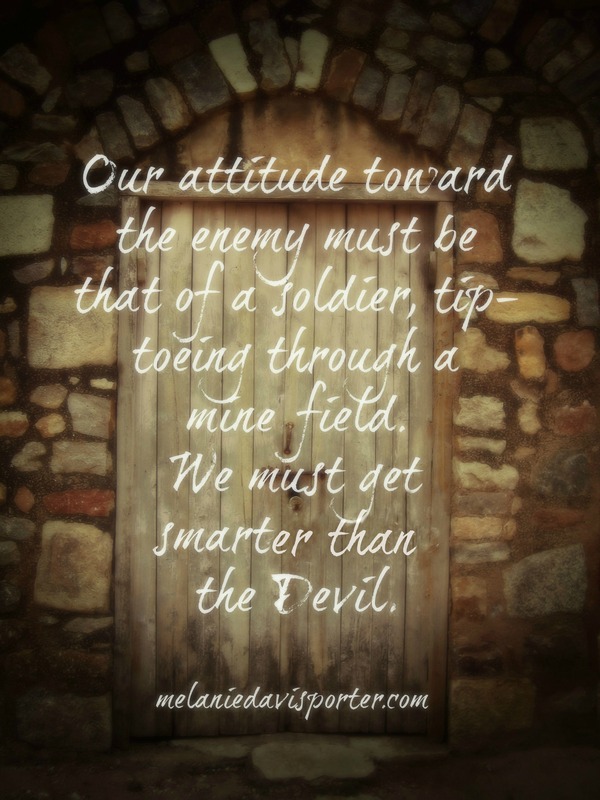 Our attitude must be that of a soldier tiptoeing through a mine field. Because we don’t palpably see him….we forget about him. We must get smarter than the Devil. 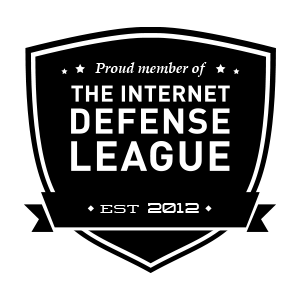 We must watch for the traps…deceptions…the dangers. 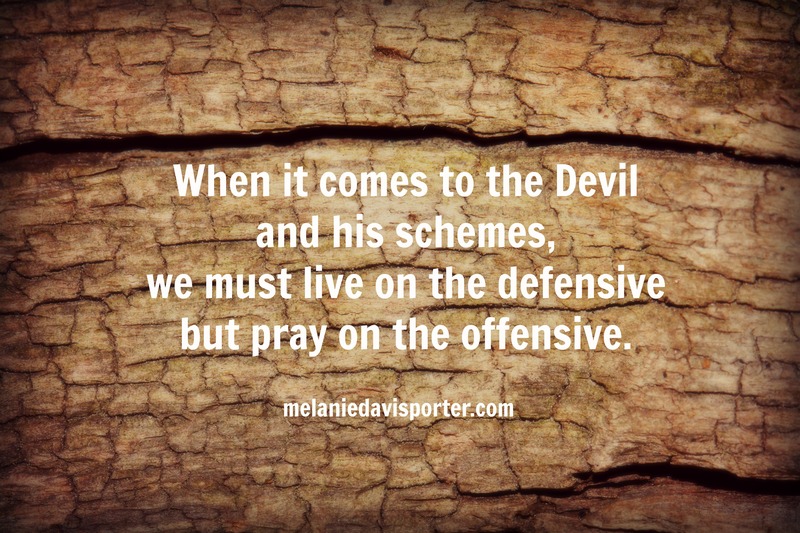 When it comes to the Devil and his schemes, we must live on the defensive but pray on the offensive. We must be wary of our weaknesses before he uses them against us. We must assert truth to our situations when he whispers lies. We must affirm the word of GOD when he hurls the accusations of the world. We must prepare ourselves for the life and death battle to finish well. We must prepare for the battle…every day. Any negative thought, past sin or hurtful memory that comes to us…..is of the Devil. God will not bring up your past, or feed the hurt. Simply refuse to listen or think on it. Instead replace it with scripture, prayer, worship, and truth. When the Devil tries to dig up your past, immerse yourself in truth. Believe who you are and take authority over his ploys. Be a fierce soldier and put on the armor of God before you take your first breath of the morning. Suit up soldier and use your battle plan, don’t let the enemy gain any ground. So I tripped over a memory and lost my balance for a while….and then I remembered who I am. What have you tripped over today? How can a girl ardently seek Jesus every day and still worry? How I’ve wrestled with this question so many times. 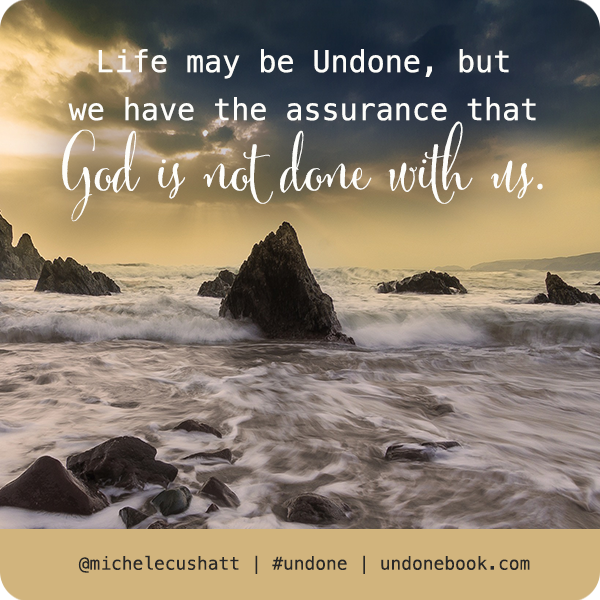 Such wise insight from Michele’s new book, Undone. 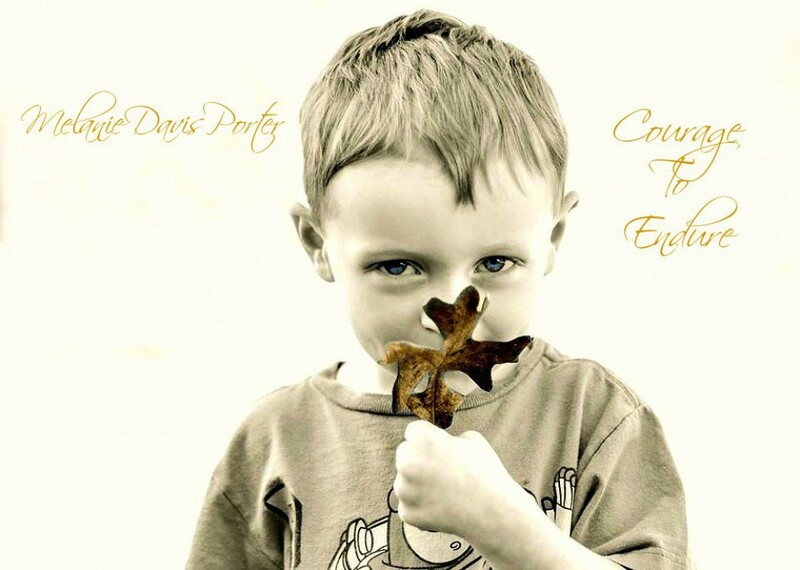 Bottom line, if we don’t choose faith….we won’t have faith. Michele’s story is probably similar to the rollercoaster story we all find ourselves riding, yet somewhere between the hurts, the heartaches, the losses, the failures and even the cancer…. Michele finds the beautiful artist, lovingly at work……one brushstroke at a time…..in a life that is undone. This resolute heart for Jesus has met him in the tender, swollen and irritated moments of weakness…and found….his presence is enough for each moment. She reminds us that even life with the most imaginable hurts is in the here and now. You see….when life becomes undone…..in just one phone call or one indiscretion or one bad decision…..we are forced to stop in the middle of the road. Or we can breathe in the presence of the great artist and choose faith. 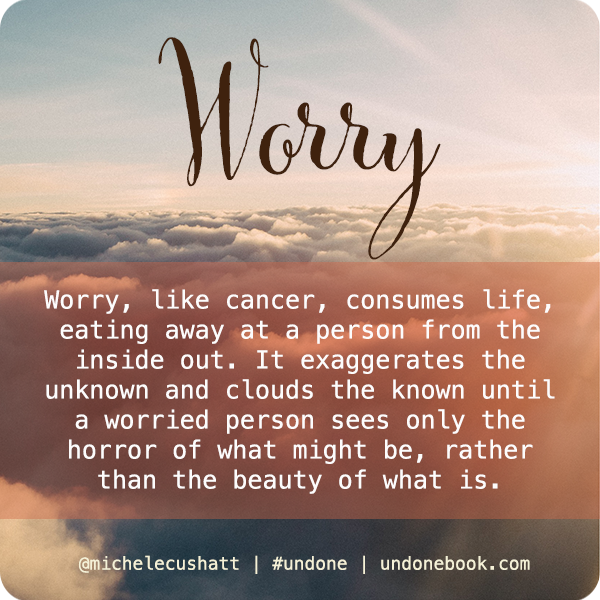 What has worry ever done for you? Nothing friend…nothing. Worry seeks to take what good there is in life and condemn it with the hurt, the pain, the cancer and the loss. This beautiful memoir met me in a recent battle that had turned into a stronghold of worry. A blessing from God that I thought was secure in my life….all of a sudden became unsure because of greedy man. Two days ago I hit my knees at 1:36 a.m. and …..I chose faith. Life is going to come at us with both fists wielding. It may knock us down, but we can look up before we get up….and remember who is in control…trusting him to help us in each unknown moment. This is a beautiful book, one that you must read. It is a book for the divorced, single parent, the perfectionist mother or wife, the blended or new foster family, the career professional, the struggling faith walker and yes even the cancer patient. Michele relays the poignant details of her struggles refreshingly real….. yet agonizingly raw. She can take a simple bible story and retell it in a way that makes you forget you have heard it before. Filled with gospel truth yet soaked in intimate honesty, I feel like I have known Michele for years. I can’t wait to meet her face to face one day soon and put my arms around her neck, and give her a holy kiss. This brave woman gives me hope…and a new perspective. Reading this book will be a wise investment to your spiritual bank…..it will greatly strengthen and prepare you for the undone moments of life. I just want to share one more nugget of wisdom from Michele, plucking at my heart strings for this undone life I too am living…. It seems we don’t see the richness of the struggle and how we mess it up at times….until after we have experienced the mercy. What a beautiful work the great artist can do when we trust him in the unexpected and unknown. Oh thank you, thank you Jesus. If you find yourself at a place in life that is undone…..take heart my friend….God’s presence is here and now….so choose faith. He promises to never leave you nor forsake you….even when life is undone. It is an unspeakable honor to be a part of Michele’s launch team for this beautiful book. You will be able to find it in stores on March10th or go to the Undone website and preorder it now. You can also read a sample chapter and find out more about this awesome lady.